How do you like your Zinfandel? Big, bold, and jammy? Or more refined and expressive? No matter. 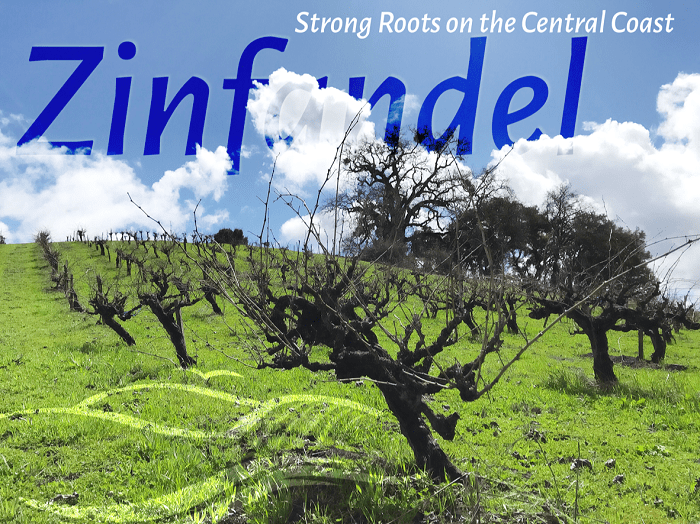 Zinfandels made in Paso Robles and the Central Coast can please a range of palates and preferences. Let’s learn a little more from member winemakers from the Zinfandel Advocates and Producers (ZAP) association. Zinfandel was brought to California during the Gold Rush between 1852 and 1857. Originally from Croatia, where it’s known as Tribidrag, it’s a clone of the Primitivo grape, from southern Italy’s Puglia region. Today, Zinfandel—known as California’s Heritage Grape—is the third-most-produced grape and is grown in 45 of California’s 58 counties. Tom Myers, winemaker for Castoro Cellars, points out prominent Zinfandel vineyards in the Paso Robles AVA. San Luis Obispo County, including Paso Robles to the north and Arroyo Grande to the south, ranks 6th in production, according to the California Agricultural Statistics Service. But all this dry history doesn’t share the flavor. Let’s open a bottle (or three) and see what’s inside. Zinfandel has long been a palate pleaser. This medium- to full-bodied red wine is known for its aromas of cardamom, licorice, smoke, star anise, and black pepper. Fruit flavors range from ripe apricot and nectarine to raspberry, sour cherry, blueberry, plum, blackberry and boysenberry. Spices can include Christmas spice, Asian 5 Spice, sweet tobacco, and white and black pepper. Some Zinfandels from around the state are made in a high alcohol, low acid, and supremely jammy and fruity style—and it’s yummy, trust us. But the grape can also be highly expressive of its location and reward winemakers seeking to take the grape in more refined directions. 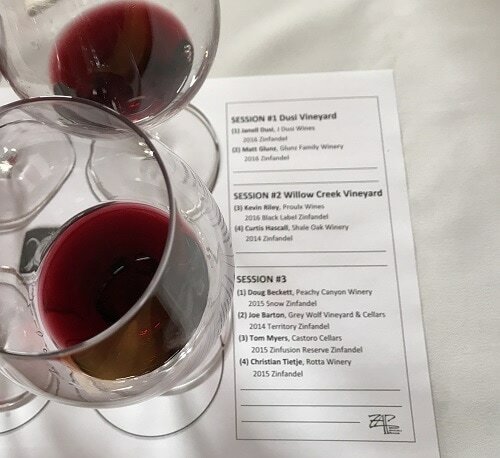 Central Coast winemakers discuss their passion for Zinfandel at the spring educational seminar hosted by the Zinfandel Advocates and Producers. 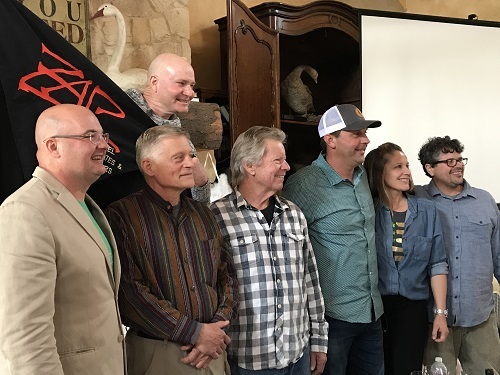 From left: Kevin Riley (Proulx), Tom Myers (Castoro Cellars), Christian Tietje (Rotta), Doug Beckett (Peachy Canyon), Tom Barton (Grey Wolf)), Janell Dusi (J. Dusi WInes), Curtis Hascall (Shale Oak). Not pictured: Matt Glunz (Glunz Family Wines). Here are a few examples from Paso Robles winemakers we met at the Zinfandel Advocates and Producers (ZAP) Seminar hosted in March by Proulx Winery. Castoro Cellars in Paso Robles: Zinfandel has been part of every year’s production, under the care of winemaker Tom Myers. Their Whale Rock Vineyard is a little cooler and produces grapes with better color and more tannin. He creates dry wines with no residual sugar, and a lower alcohol around 14.5 percent that highlights the bright fruit. Glunz Family Wines in Paso Robles: The Glunz family has been in the wine and spirits business in Chicago for more than 100 years. When it was time to expand their operation to the west coast, Matt Glunz knew it would be in Paso Robles. The area’s huge diurnal swing results in wines with bright fruit and good acidity. The stems added a nice element of cinnamon to the 2016 vintage. 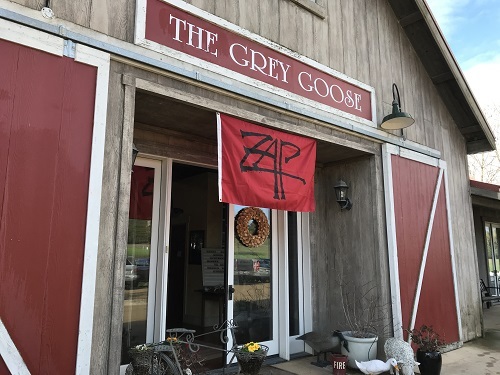 Grey Wolf in Paso Robles: Joe Barton started the winery in 1994 and sees that as Zinfandel becomes more terroir-driven, it’s a very transparent fruit with tastes that are unique to the site, much like Pinot Noir. J. Dusi Wines in Paso Robles: Janell Dusi grew up on the family vineyard that was first planted in 1925, and her old vine Zin grapes are coveted by other winemakers. She takes a hands-off approach, with very light new oak, to produce leaner, lower alcohol wine that is almost Old World in style. Peachy Canyon in Paso Robles: Doug Beckett opened the winery in 1988, and today Zinfandel is 80% of their production. He believes there’s no better area in California for Zinfandel than here, and Paso Robles history is filled with Zinfandel. He’s seen the style transition from 17% alcohol and lots of oak to today’s Zinfandels with a more refined approach. Proulx in Paso Robles: Kevin Riley, who emceed the ZAP Seminar, is winemaker for his Proulx family winery and a wine consultant, believes Paso Robles is one of the best places to grow Zinfandel. He allows the expression of each block to shine through dry farming and caretaking the old vines on their historic vineyard (some are more than 50 years old), combined with multiple passes through the vineyard during harvest to select the best fruit. Rotta Winery in Paso Robles: Rotta is home to the oldest winery building on the Central Coast, and winemaker Christian Tietje is passionate about showcasing the quality Zinfandel from Paso Robles and its uniqueness. He believes it’s vital to hold on to the acid, which is also helped by the soil composition, to create a more restrained, elegant wine that’s food friendly and ageable. Shale Oak in Paso Robles: Winemaker Curtis Hascall creates Zinfandels that are balanced and rich, but not heavy. He finds that Paso Robles grapes produce flavors found nowhere else. Tasting flights from the spring ZAP education seminar held at Proulx Wines in Paso Robles. Saucelito Canyon in Arroyo Grande: Although not presenting at the ZAP seminar, another winery known for its long history producing great Zinfandel is Saucelito Canyon. Its vineyard, located in the Arroyo Grande Valley, contains Zinfandel vines planted in 1880, making it the oldest commercial vineyard in San Luis Obispo county. Two generations of the Greenough family have been producing Zinfandel since 1974 with an approach that maintains the bright fruit and lively natural acidity. What the Heck is White Zin? Remember White Zinfandel from the 1980s? This sweet blush wine resulted from a stuck fermentation at Sutter Home Winery. Rather than dump the off-dry wine that remained when the yeast died, winemaker Bob Trinchero decided to bottle it. White Zin became a hit and the rest is history. 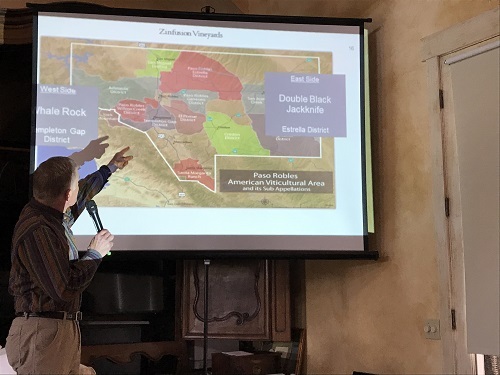 Proulx Wines hosted the spring 2018 educational seminar of the Zinfandel Advocates and Producers (ZAP) association.